Welcome to Journal of Balkan Ecology! Journal of Balkan Ecology is an international journal for scientific, educational and applied information covering all aspects of the processes concerning the environmental quality of our planet. The Journal is dedicated to the fundamental and technological research on main problems of the natural and anthropogenic ecosystems in all scientific areas. It is devoted to the protection and improvement of environmental quality. 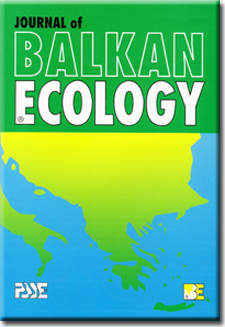 The Journal of Balkan Ecology comprises the significant achieve­ments of the national ecologies in the Balkan countries and all the rest countries around the world, and establishes communication with the international ecological organizations to up-date their activity in these countries. The Journal serves to interchange information concern­ing ecologically grounded decisions and actions. It stresses on the contamination sources; the monitoring of physical, chemical and biological pollutants; the media subjected to different kinds of pollution; and the technologies for improving the environment. Food Safety, Soil Processes, Pollutant Transport, and Land Use; Water Quality, Aquatic Processes, Biodegradation and Bioremediation; Atmos­pheric Pollution; Living Creature and Environment Interactions in the Ecosystems; Heavy and Transition Metals in the Environment; Organic Chemicals in the Environment; Waste Management; Ecological Education and Legislation; Ecology and Economics; Ecology and Philosophy; Ecology and Industry; Ecology and Transport; Ecology and Energetics; Ecology, Medicine and Health; Problems of the Natural and Cultural Heritage, Ecology and Religion. The Journal is financially based on the subscription and author fees of 80 EURO per paper only. The scientists working at institution, which is subscribed to the Journal, can pubblish free of charge.